My new order for the Marie Veronique Organics MVO Desert Island Duet just came in and I was so surprised that the two products came individually packed in a box! Check them out! 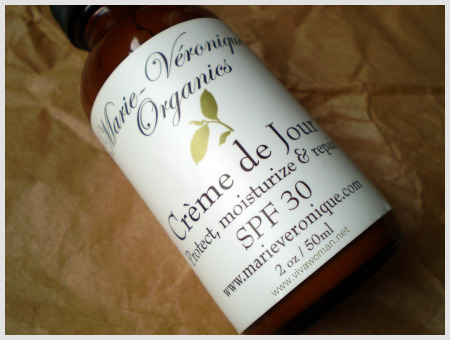 I know the brand made some adjustment to the names of their products like the Marie Veronique Organics Moisturizing Face Screen SPF30 is now MVO Everyday Coverage SPF30. But packaging too? I’m guessing it is a new positioning they’re adopting to make their brand more premium, especially given the fact that they now have a store front at Mill Valley and their products are being carried in some spas. The Marie Veronique Organics MVO Desert Island Duet consists of the MVO Everyday Coverage which is a moisturizing sunscreen and MVO Face Oil which has some sun protection properties. The kit retails for US$115. 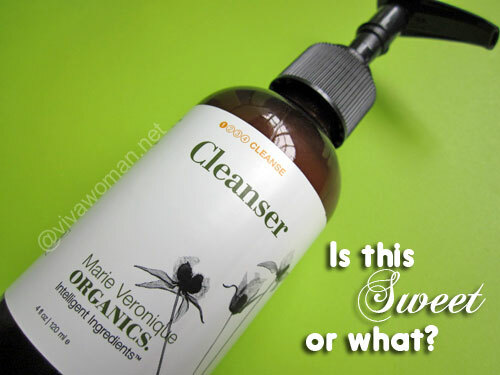 I started using products from Marie Veronique Organics since 2009 and changes to their product names are not new to me. 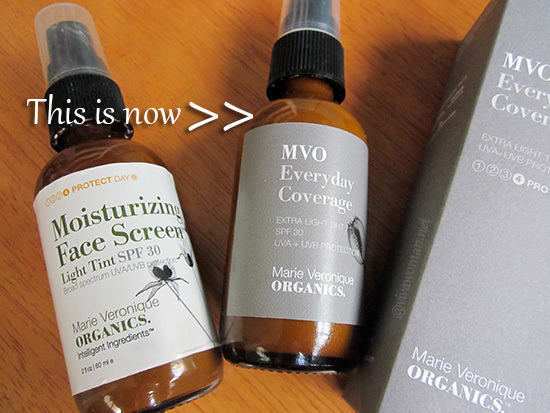 Their sunscreen started out as Creme de Soleil and it became Moisturizing Face Screen and now, MVO Everyday Coverage. It’s a bit confusing especially because the changes are kinda frequent and Everyday Coverage was a different formulation with SPF20 previously. I truly hope this current name is staying put! Apart from the name, I was also a bit confused by the tints that I ordered the wrong one last round. I’ve always used the non-tinted version but it is now known as extra light tint. I ended up ordering light tint by mistake. If you’re new to the brand and would like to know the swatches for the various tints, you can look up this post. Okay, back to the packaging. Although I don’t mind the extra paper box and it doesn’t influence my purchasing decision, I’d thought that reducing packaging components is more eco-friendly especially for a brand promoting green beauty. 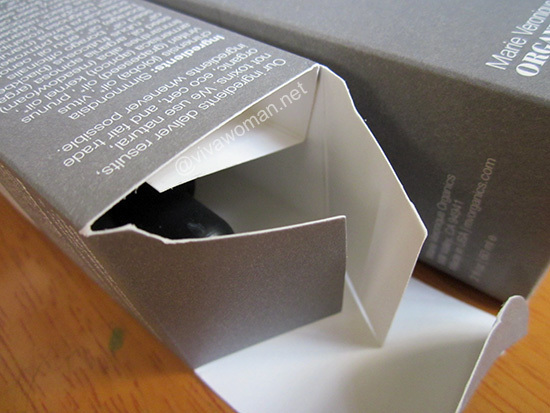 In fact, I noticed that even the mainstream brands are trying to be go green by reducing their packaging. Anyway, I’m headed back to using facial oils, at least for the day now. This is after laying off facial oils for about two months. I really miss facial oils and so I decided to order the MVO Face Oil and hence, the duet. know I can easily use a cheaper facial oil but I’m in the mood to splurge. In addition, this facial oil comes with lots of goodies like krill oil, argan oil and blackberry seed oil. 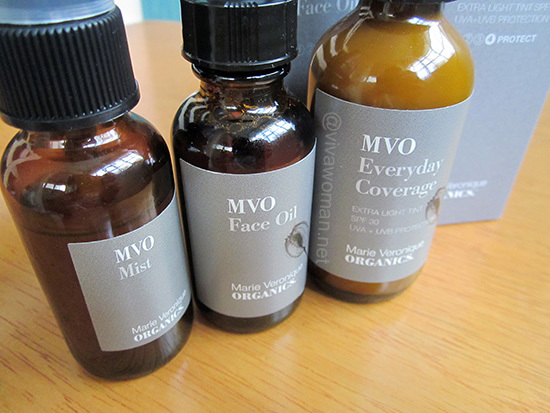 The MVO Face Mist was given free with the MVO Desert Island Duet and doesn’t come with a box. 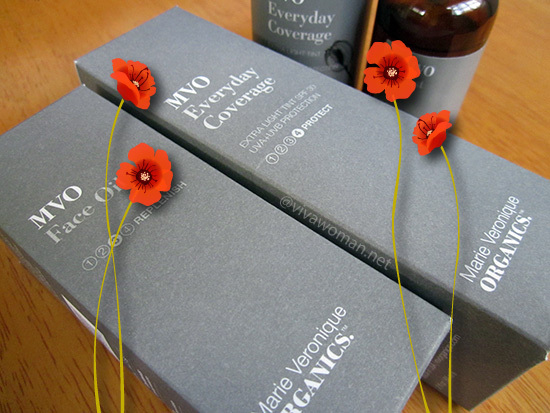 For those interested to know, the MVO Everyday Coverage should last around six months with daily usage. Â For more information on the products, check out their website. Although they look more ‘premium’ now, I don’t necessarily like the idea of having boxes — additional clutter to worry about. 🙁 But that’s just me. I know some people are very particular about packaging. I bit the bullet and got the pacific night serum with retinol recently after months of debate with myself whether to splurge or not. Can’t wait! They don’t affect me much as I usually just toss them out. Yup, I know…that’s what I think too. I found it strange to move from having no packaging to introducing packaging. I was shocked when you mentioned the bottle lasted you for 6 months. I use up one bottle in about 2 months and I use 2 pumps for the face only. Maybe I’m using way too much?? How many pumps/squirts do you use for your face Sesame? And do you use the MVO ss on your neck too? Just one, maybe a little under 1/4 spoon. I tracked the last order till now, indeed it was 6 months. I think about 5 – 6 months usually. But 2 months? Woah…that’s quick. Usually 1/4 teaspoon is a good gauge for the face. But you can apply more if you’re comfortable with the idea cos I may not be getting full SPF30 protection. I use Badger on my neck. I’m not sure whether have MVO change the formula when they change the name from Face Moisturizing Face Screen SPF 30 to Everyday Coverage SPF 30. I feel that the texture is drier this time, quite difficult to apply. The one with previous name was much more moisturizing and easy to apply..
Hmmm…I wonder if it’s a batch issue. You can write in to them to give some feedback. So far, it still works for me but I’m going to reorder and certainly don’t like the idea if it’s going to be drier. Hi Sesame, I’ve tried their travel sized anti-aging oil after reading your reviews but find them somewhat oily for my face. I’m in my 40s and faced with increasingly dry skin for over a year but no face (cream) moisturizer seems to help. I’m wondering if you have tried MVO Pacific range of face oil and night serum with retinol? Do you encounter oil clogs when using MVO face oil under your skin? Thanks for sharing. No, haven’t tried that range apart from their latest Pacific Lip Treatment. I use their face oil daily with no issues of clogging. You need to apply while your skin is damp. I use it in the day under the MVO Moisturizing Face Screen and sometimes in the night with another moisturizer or alone. Dry skin can be due to internal factors too. At this age, it is quite common. The issue may not be so much as moisturizing but hydrating. Sorry I meant to ask whether does your skin clog when using MVO face oil under makeup, that is with foundation and powder. Thanks Sesame. 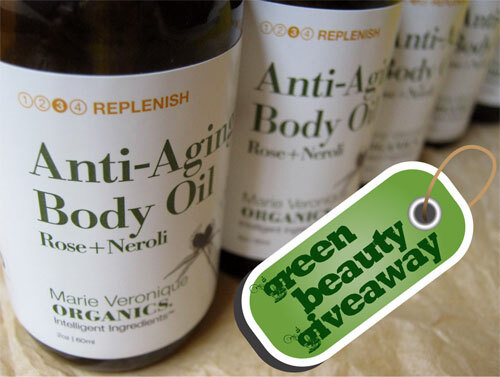 I stumbled upon your post on Marie Veronique Organics and am thinking of trying the face oil and acne relief travel kit for a start. I would appreciate if you could confirm that I should be ordering from http://www.mariveronique.com and not http://www.tnbotanicals.com. Many thanks in advance. Yes, should be Marieveronique.com. They splitted into two different companies recently. Thanks so much for taking the time to reply! I so glad I stumbled upon your blog; it’s so informative and interesting! Recently started following your blog. Very interesting articles u have. Like your opinion on this: I have easily congested skin and was thus recommended to use oil-free products by my dermatologist. 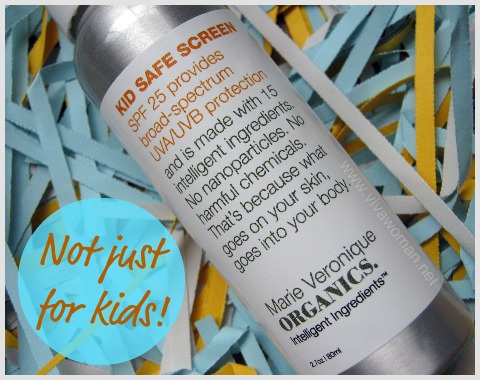 Do you think the MVO Spf 30 sunscreen and face oil are likely to cause clogged pores? TIA!